Pluto seems to be perennially in the news. What's this planet (or is it a planet) up to now? The monthly JPL "What's Up" video podcast (above) features the January Quadrantids, which is a meteor shower that peaks in the morning hours of Tuesday January 4th. It's a good night with no moon, and while the shower will look best for our friends in Europe, if it's clear and you are awake, you should be able to spot it between and below the big and little dippers. I thought it interesting that the meteor shower was named after a constellation that has been demoted. You're not alone Pluto - that International Astronomical Union is a cold-hearted bunch. Generally interested in meteor showers? Here's a meteor shower calendar. Demoted again: Pluto's ego took another blow this week when it was discovered that dwarf planet Eris is slightly bigger than the former "official" planet. (Drawing courtesy of NASA)I guess you could call Pluto the Rodney Dangerfield of our solar system…it just doesn’t get any respect. Last summer Pluto got demoted from an official planet in our solar system and placed in a new category of heavenly bodies: dwarf planets. Now with more research, it’s been determined that Pluto isn’t even among the largest of the dwarves. 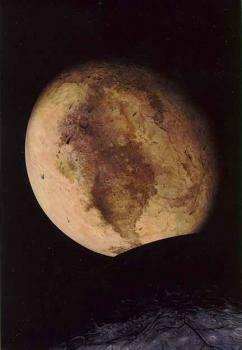 Eris is the cause of all of this turmoil of Pluto’s status. 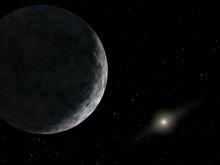 That dwarf planet was discovered to have similarities to Pluto and led astronomers to relook at how they define planets. Pluto and Eris were both bumped into the dwarf plant status. Now, the size of Eris has been measured: a diameter of 1,490 to 1,860 miles. Pluto’s diameter is a shade smaller: 1,430 miles. All of these details came to light after astronomers discovered a moon, Dysnomia, circling Eris. Judging from the speed that Dysonmia has spinning around Eris, researchers have determined that Eris is about 27 percent heavier than Pluto as well. Both dwarf planets are made up primarily of rock and ice. Don’t worry about any physical effects from this growing dwarf planet rivalry. Eris’ orbit is about twice as far away from the sun as Pluto’s. They’re a quite safe distance apart from each other. Artist's concept of Eris. : Image courtsey NASA/JPL-Caltech. The “Tenth Planet” that caused Pluto to lose its planetary status has been classified and named, and to the dismay of many, it was not named Xena. The International Astronomical Union has classified it as a dwarf planet and named it Eris, after the Greek goddess of Chaos, which is appropriate for the chaos it cause in the astronomical community over what should be defined a planet and what should not. The debate centered around the argument that if Pluto was considered a planet, then 2003 UB313, as it was known at the time, should be a planet as well as it was larger than Pluto. The debate culminated at the International Astronomical Union meeting last month where Pluto was stripped of the title “planet” and relegated to “dwarf planet” along with Eris and the former asteroid Ceres. Eris' moon was also given a formal name: Dysnomia. In Greek mythology Dysnomia was the daughter of Eris. Sad about Pluto's demise? Go to a wake. The folks at the Minnesota Planatarium are planning a wake due to Pluto's loss of planatary status. Join them at Joe's Garage in Minneapolis on Thursday, August 31 from 7 to 9 p.m.
Join us for a wake in honor of our dearly departed planet Pluto. It was a good planet, and although it will have new life in the ranks of dwarf planets, we'll remember it how it was in its full planetary glory. We'll also have a telescope on the roof to view the quarter moon. Parke may be persuaded to give a short Eulogy. Costumes not required but prize for best Pluto costume. From 9 planets to 12...to 53? The 12 planets: In this artist's impression the planets are drawn to scale, but without correct relative distances. Image courtesy the International Astronomical Union/Martin Kornmesser. The international panel that was formed to establish a scientific definition of a planet will make a recommendation to the International Astronomical Union (IAU) General Assembly that will increase the number of objects in out solar system that are defined as planets from nine to twelve. The panel was originally formed to discuss the issue of Pluto’s status as a planet. Not only does the panel recommend retaining Pluto’s planetary status, but also promoting Ceres, Charon and "Xena" to planets. The new definition of a planet is that it has to orbit a star, not be a star itself, not a satellite of another planet, and massive enough that its gravitational forces compress it into a roughly round shape. This opens the door for many more objects in our solar system to be called planets, notably Vesta, Pallas and Hygiea. In fact, there may be more than 53 objects that meet the new criteria to be called a planet, and probably many more yet to be discovered. The proposal is not final, and will be discussed on August 23 at the International Astronomical Union General Assembly meeting in Prague. Watch a fly by of the new solar system here.